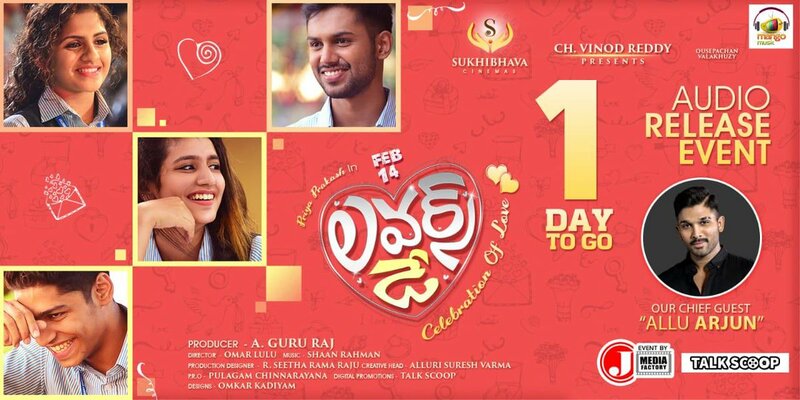 Actor Allu Arjun is going to attend the Lovers Day Movie Audio Launch Event in which wink girl/Internet sensation Priya Prakash Varrier is playing the female lead. Lovers day is the Telugu dubbed version of Malayalam movie ‘Oru Adaar Love‘, which is gearing up for a grand release on 14th February on the occasion of Valentine Day 2019. The makers of Lovers Day is planning to organize the audio launch event of Lovers Day on 23rd January 2018 in Hyderabad and Lovers Day Movie Audio Launch Event Chief Guest Allu Arjun. He will share the same dais with Sensation girl Priya Prakash Varrier. Recently Priya Prakash Varrier Most Searched Personality on Google India 2018. Oru Adaar Love is directed by Omar Lulu and produced by Ousepachan Vaalakuzhy under Ousepachan Movie House. The Lovers Day Movie narrates the romance story of two high school students in Kerala. The film gained nationwide attention due to a clip which went viral.